FrootVPN is a VPN service started and ran with this goal in mind: to make people secure and anonymous online. We commit ourselves to bring you services that are affordable but of the best quality. With our vision of focusing on what’s important: ease of use, speed, reliability, and security, we set out to make a change in today's VPN industry. With over 300,000+ users enjoying the services we provide is only one proof that FrootVPN is consistently being one of the best VPN in the market today. FrootVPN is a highly secure VPN which ensures full privacy on all your devices connected via the VPN to web. By going through our VPN tunnel no one else can access your data. There's a lot of reasons why you should use FrootVPN. Check the list down below to know more! While being connected to FrootVPN on hotspots and wifi network, we encrypt your connection up to 2048 bits encryption and protect you against hackers reading your data. With FrootVPN, you can access services like Facebook, Twitter, Skype, YouTube, and Gmail, even if you are in a country or a private network where the access is blocked. We do care about your internet privacy and therefore we do not log anything at all. Your details will never be shared with any third party. FrootVPN encrypts your connection up to 2048-bit encryption to protect you against your Internet provider or your government spying on your online activity. With our VPN you'll be safe to log in on your bank online or connect to public hotspots. FrootVPN hides your IP address and location and make it harder for third parties to know who you are and where you are located. Our service protects your identity and makes sure you can surf the web anonymously. The network is highly secured with SSL and all servers are connected to multiple 10Gbps backbone. Above all, unlimited bandwidth is provided to all customers. With our service your IP address will be switched to a new one, making it look like you are in a different location to bypass any restriction. 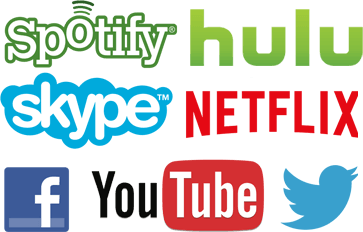 Un-block services like: Netflix, Hulu, Spotify, Youtube, Facebook, and more. Connect to any of our locations when using our VPN! FrootVPN works on all devices you can use our VPN service with Iphone, Ipad, Android, Windows, Mac, Linux and even on your router!